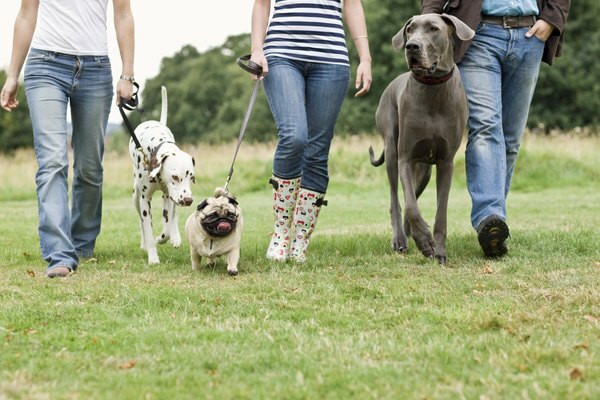 Teach your dog to stay calm when your friends are around. Although you like your friends and consider them to be nice people, Gromit might disagree. Your pet companion might growl and bare his teeth at the sight of your friends. Knowing how to manage and stop his aggressive behavior is essential to keep all parties safe and happy. Gromit can growl for many reasons. Maybe he lacks socialization, or maybe he's scared, possessive, territorial or protective. Regardless of the reason, understand that your furry friend's growling is his way of telling your friends to back off, because he's close to blowing a fuse. Sure, if you consistently punish him for reacting in this aggressive manner, he might stop growling at the sight of your friends, but he also might resort to lunging and biting immediately, without giving a warning. If Gromit suddenly starts growling at your friends, take him to a veterinarian to rule out medical conditions that might be triggering his behavior. Hypothyroidism, for instance, which might be paired with lethargy, weight gain and hair loss, can be to blame for his sudden aggression. Other causes for your dog's sudden growling can include brain tumors or trauma and partial or full seizures. Your veterinarian can make a diagnosis and recommend the best treatment. Enlist the help of your friends to stop Gromit's growling. Go to a park, leash your dog and sit on a bench. Command Gromit to "sit" and have one of your friends appear at a distance. Tell Gromit "Look, it's my friend," and give him a treat if he remains calm. Have your friend gradually come closer and continue to give Gromit treats. The moment he growls, have your friend walk away and stop giving him treats. Practice this with all your friends, and eventually, Gromit will associate them with pleasant consequences and might start looking forward to seeing them. If Gromit growls at your friends when they visit your home, confine him in a separate area before they arrive. Once your friends are settled, leash and muzzle your dog, and then walk with him in front of your friends. Have them throw treats on the floor for your dog so he starts associating them with good things. The moment Gromit becomes aggressive, bring him back to the confined area and try it again a little later. Over time, he might prefer being part of the activities and getting treats instead of being confined. What Items Should Be in a Parakeet's Cage? How Many Different Types of Manx Cats Are There?